1. Said Arjuna, You have spoken to me the most confidential and supreme subject of the inner self by which my delusion has gone. 2. O Lotus Eyed Lord, I have heard from You in detail the creation and the dissolution of all the manifested forms and also Your inexhaustible greatness. 3. O Superior among men, you have spoken to me about Yourself as You are. But I wish to see your Divine Form. 4. O Lord, if you think that it would be possible for me to see Your form, then show me, O Lord of all Yogas, Your inexhaustible eternal Self. 5. Said Lord Supreme, Behold Arjuna now my numerous and various divine and colorful forms. 6. See the Adityas, the Vasus, the Rudras, the Ashvins and also the Maruts. See now O Bharata, all the wonder, which You have not seen before. 7. O Arjuna behold in one place the entire universe, both dynamic and static, and also whatever you wish to see further. 8. But you cannot see Me with your ordinary eyes. I will give you supernatural vision with which you can behold the wealth of My Yoga. 9. Sanjaya said, Having said thus, O King, Hari, the Great Lord of Yoga, showed His divine splendor to Arjuna. 10. (Arjuna saw) Innumerable mouths and eyes, numerous awesome visions, many divine ornaments and a great many weapons in striking positions. 11. Wearing many divine garlands and garments, smeared with many divine perfumes and creams, incredible was the form of God, unlimited and many faced. 12. The splendor of the great Lord was like many thousands of sun ablaze in the sky at the same time. 13. There Arjuna could see in the universal form of the Supreme God, in one place the entire universe divided into many. 14. Then (having seen the form of God), Arjuna, struck with wonder, his hair standing stiff due to the feeling of ecstasy, bowed his head in reverence before God and spoke to Him with folded hands. 15. Said Arjuna, I am able to see O Lord, in Your divine body all the gods and living entities. Also Brahma, the creator sitting in the lotus flower, all the sages and many divine serpents. 16. I am seeing innumerable hands, bellies, mouths, and eyes. You are indeed every where with an unending form. O Lord of the Universe, I am unable to see the beginning, the middle and the end of Your universal form. 17. With Your crown, mace and weapon, Your effulgence is glowing in all directions, It is difficult for me to see your brilliance that is blazing everywhere like that of the sun which is immeasurable. 18. You are imperishable, the highest (knowledge) to be realized. You are the resting ground for this whole universe. You are the protector of the eternal dharma. It is my conviction that you are the most Ancient Being. 19. I behold You as the One without a beginning, middle or end, with infinite energy, innumerable hands and eyes like the sun and the moon. A blazing fire is coming out of Your mouth. And You are keeping the whole universe heated with Your inner glow. 20. All that is between the heaven and the earth, is pervaded by you only in all directions. Seeing your wondrous and terrible form all the three worlds are trembling with fear, O Highest Soul. 21. All the celestial beings are entering You only. Some of them are bowing to you with folded hands offering You prayers. Hosts of saints and seers are singing hymns of peace and chanting Vedic verses. 22. Rudra, Adityas, Vasus, Sadhyas, Vasudevas, Aswins, Maruts, Ancestors, Gandharvas, Yakshas, demons, siddhas (spiritually perfected beings) are all gazing at You with amazement. 23. Seeing Your mighty form with so many faces, eyes , mighty arms, thighs, feet, multitude of bellies and teeth, all the worlds are shaking with fear and so do I. 24. O Vishnu, looking at Your expansive form reaching out to the heavens, glowing with innumerable colors, mouth widely open, bright wide eyes, I am certainly terrified in my heart and lost my inner stability and tranquility. 25. After seeing Your terrible face with so many teeth I feel as if the fire of death is standing in front of me. I have lost my sense of direction and I do not know what to do. O Lord of all and Dweller of the worlds, be kind to me. 27. Are passing through Your mouth between Your blood curdling, terrible teeth. Some of them are struck there with their heads crushed between the teeth. 28. As great many rivers rush into the sea, so do these heroes of the mortal world are going into Your blazing mouth. 29. As the moths rush into the blazing fire for its own destruction with full speed, so are these people are rushing into Your mouths at full speed for their own destruction. 30. You are sucking all these people into Your blazing mouths from all directions. The whole universe is aglow and heated up with Your angry majestic rays, O Vishnu. 31. Please explain to me who You are in that fierce form. Salutations to You Chief of gods. Be gracious to me. I wish to know about You, O Original Being for I do not know Your inner mechanism. 32. Said Lord Supreme, I am Time, verily the great destroyer of the Worlds engaged now in the destruction of people. Even without you, all the warriors on either side are going to be destroyed. 33. Therefore get up and fight to earn fame, conquer your enemies and enjoy kingdom of abundance. They are already killed by Me . O great archer, you are but an instrument. 34. Drona, Bhishma, Jayadratha, Karna, and other great warriors have already been killed by Me. Therefore do not feel agitated . Just engage yourself in the fight and you are bound to destroy your enemies. 35. 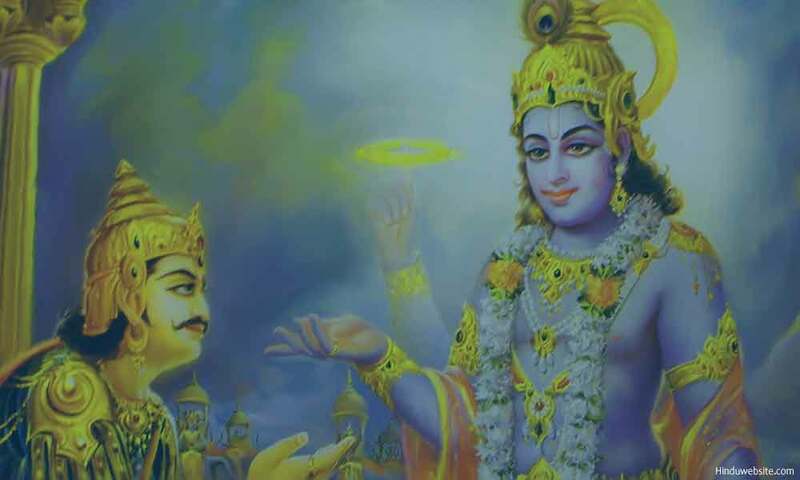 Said Sanjaya, Thus hearing the speech of Krishna, with folded hands and trembling, Arjuna offered obeisance again and again to Lord Krishna and spoke to him in a voice fully choked. 36. Said Arjuna, O Master of the senses, Your glories are causing the entire world to rejoice and become attracted to You, while the demons are fleeing in all directions. Groups of Siddhas (perfects beings) are bowing before you in adoration. 37. But why should not they worship You, O Exalted Soul, for You are superior to even Brahma (the Creator)? You are the Original Creator, Unlimited, God of gods, Universal Dweller, Imperishable, Being and Non-Being (Reality and Unreality) and That Supreme also beyond these two. 38. You are the Original God, the most Ancient Being. You are the Ultimate Refuge of this and other worlds. You are the knower and the knowable, the transcendental goal. The whole universe is pervaded by You O Being of unending forms ! 39. You are Vayu, Yama, Agni, Varuna, the Moon and Brahma and also Great Grandfather (of all these gods). Salutations and Salutations to You a thousand times and salutations and salutations again. 40. My salutations to You from the front and the back and from all directions for You are omnipresent with infinite powers and boundless energy. Everything is enveloped by You and You are all that is. 41. Without knowing Your true greatness, accidentally or out of love, I have addressed You variously as My Friend, Krishna or Yadava. 42. Whatever ridicule or disrespect I might have shown in front of You, O Intangible One ,while at play, lying down, sitting, eating food, alone or in the company of friends, please do forgive me O noninterfering One. 43. You are the Father of the entire world, the moving and non-moving. You are among the worshipable and glorious teachers There is nothing that is equal to You in the three worlds. Then how can there be anything else that is greater than You O Being of unbound influence? 44. Therefore prostrating my body in front of You, O God, I offer my obeisance to You and seek Your blessings. Please forgive me, O Lord, the way a father tolerates his son, a friend his friend and a lover his beloved. 45. Seeing what I have never seen before I am joyous. But at the same time my mind is greatly disturbed and filled with fear and consternation. Please show me Your normal divine form. O God of the gods, Dweller of the Universe. 46. I wish to see You in your normal form with four arms wearing golden crown and holding the mace and disc in Your hands. Assume that form again O Lord of Thousand arms and Universal form. 47. Said Lord Supreme, Pleased with you, O Arjuna, I have shown You this transcendental form of Mine through atma yoga (union of the Selves) that (form) which is full of brilliance, universal, unlimited and from the beginning. Other than you no one else has seen It. 48. Neither through the study of the Vedas, nor through the performance of the sacrifices, nor by giving charities, nor by performance of rituals, nor by observance of severe kind of penances can any one see Me in this form in this world other than You, O the exalted among the Kurus. 49. Do not be agitated or deluded by seeing such terrible from of Mine. Freed from all fear, with pleasant mind, see this form of Mine again. 50. Said Sanjaya, Having spoken thus Vasudeva showed his normal form to Arjuna. Assuming His pleasant form, the Great Soul, tried to revive the spirits of fearful Arjuna. 51. Said Arjuna, Seeing this very gentle human form of Yours, O Janardhana, I have regained mental stability and returned to my original nature. 52. Said Lord supreme, It is indeed very difficult to see this form of Mine which you have seen. Even the gods always aspire to see this form mine of Mine. 53. Neither through the study of the Vedas, nor through severe penances, nor through the charities, nor through sacrifice it is possible to see Me in the form which You have seen Me. 54. But through intense, undistracted devotion, it is possible not only to see Me in this form O Arjuna, but also know My true nature and enter into It. 55. But My true devotee, who works for Me only considering Me as the Transcendental Supreme , renouncing all attachments without any rivalry towards all the beings, would certainly comes to Me , O Pandava. Thus ends the eleventh chapter named the Yoga of Supreme Cosmic Vision in the Upanishad of the divine Bhagavad-Gita , the knowledge of the Absolute, the yogic scripture, and the debate between Arjuna and Lord Krishna. Copyright: All rights are reserved. No part of this publication may be reproduced stored in a retrieval system, or transmitted in any form or by any means, electronic, mechanical, photocopying, recording, scanning or otherwise, except for your personal use, without the prior written permission of Hinduwebsite.com or the author Jayaram V. If you want to publish the FREE Translation of the Bhagavad gita on your website please contact us and take our prior and written approval.